I just got home from Fall Quilt Market in Houston last night, and it was a BLAST! While I download my pictures and collect my thoughts for a proper blog post, allow me to catch up on some of my draft posts that I haven't had a chance to publish yet. I think I've mentioned before that I serve as the "swap swami" (not my choice of title!) 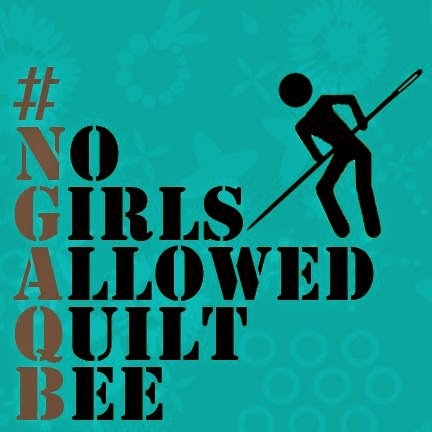 for the Triangle Modern Quilt Guild. That means I try to organize fun activities and swaps for all of the guild members. 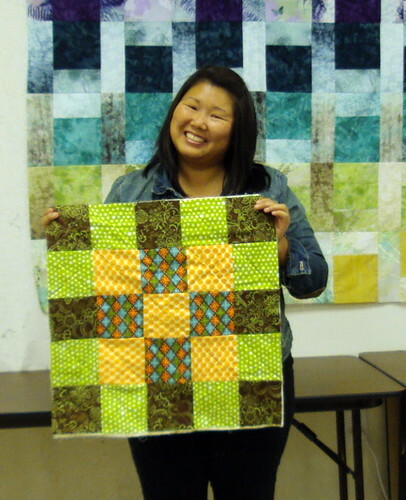 Recently, I worked with the awesome, generous folks at Robert Kaufman fabrics to challenge the guild members with a fun challenge (hi, and thanks Allie!) 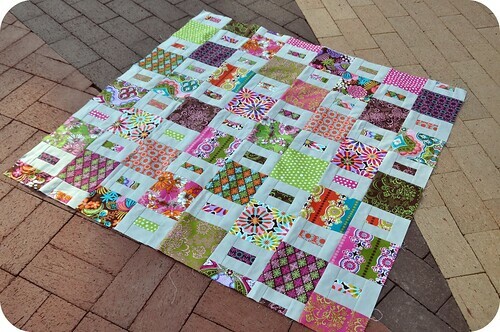 Inspired by Tula Pink's Project Plume with the Kansas City Modern Quilt Guild, we provided each member of the guild with a Ten Square of the Glam Garden collection by Josephine Kimberling. The challenge? 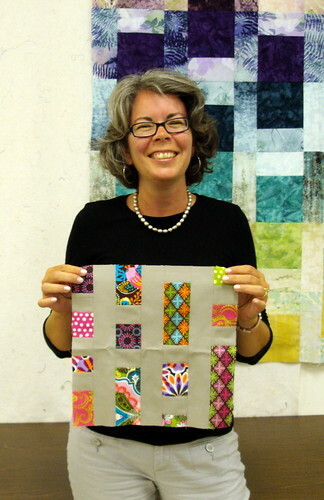 Make a project of your choosing with the Ten Square and, if desired, only ONE additional fabric. 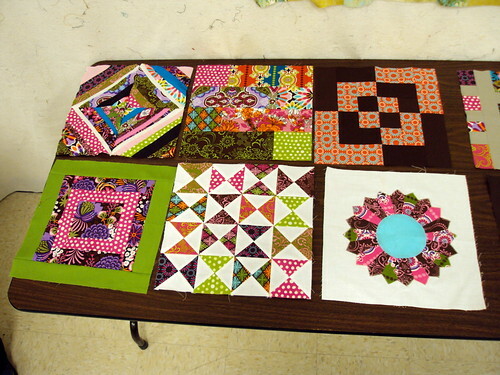 The project could be anything -- a quilt, a mini quilt, a table runner, a bag, a garment ... anything! 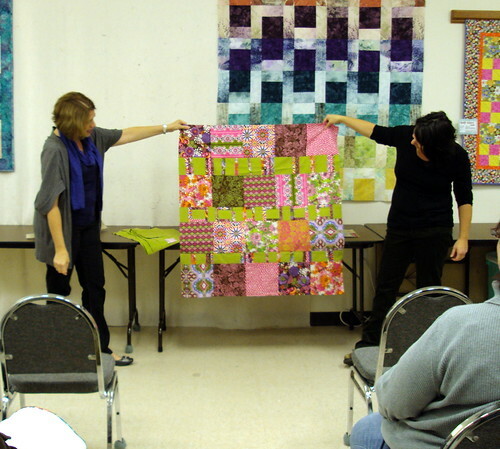 At our last meeting, we hosted the GLAM GARDEN GALA, where we all showed off the items we made with the fabric. 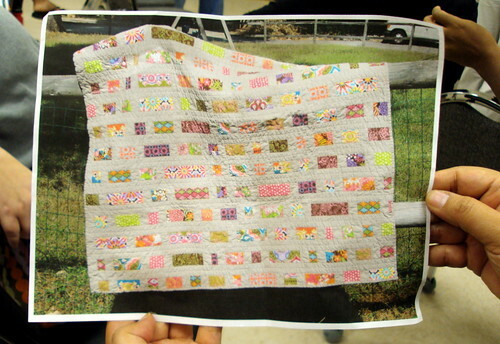 Here are some picture of the other members' projects. 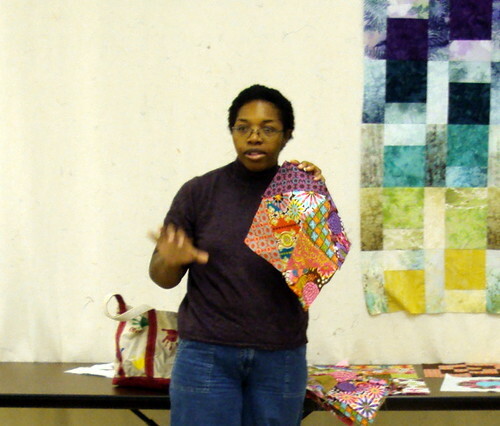 All pictures taken from the Triangle Modern Quilt Guild Flickr pool. This was such a great activity for our guild. BIG, BIG THANKS again to Allie and the gang at Robert Kaufman. We couldn't have done this without you! Awesome post! The person in our KC guild who used the same look as you is my mom, Mary! Fun! I loooove that you had people make an extra block in return. What an excellent idea. I'll have to store that one away for a future challenge. Wasn't it so much fun to see how people used the same set of fabrics and came up with such different looks? Nice quilt! It's so sparkly and simple! Thanks for the update. Holy cow that's so creative!! I love it!! 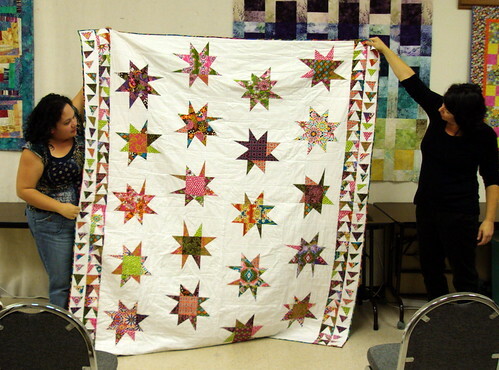 Wow, the quilts are amazing. That was a fun challenge. It's fun to see what someone can do with just a little bit of fabric and I like the fact that not everyone used white as their background color. Great to meet you at market. You're a lot of fun to hang with. Just wished we had more time together. Maybe SLC. I love seeing where each person's creativity takes them with the same fabrics. So cool to see all the different quilts. What a talented group, and a great idea! My guild had its first meeting in October, I'll bring this idea to our November meeting! great awesomeness! the houston mqg is in the planning stages of a challenge as well. it was decided this morning what fabric we're using - a charm pack for each and a 1/2 yd additional fabric allowed. i can't wait to see all the goodness to come from it. Wow, these are all just gorgeous! 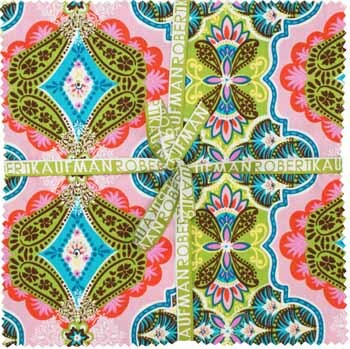 I'm going on a quilt retreat with my mother this weekend and am using a Robert Kaufman print! 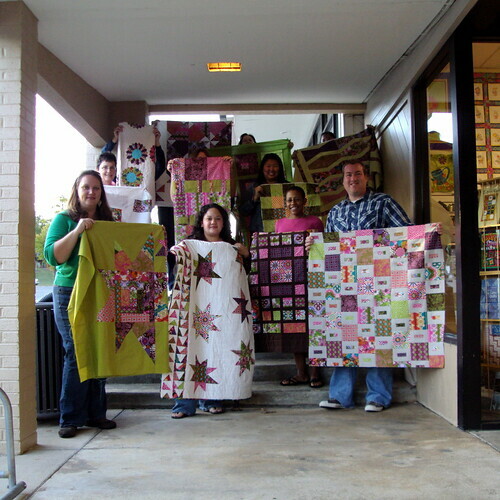 Also, the DC Modern group is making baby quilts for a local charity this month! I am so excited! Really beautiful! I love the white with the wonky stars n geese! What a fun project! There is some great creativity in your guild! I love the pattern you did with yours, really adorable. There are so many beautiful projects in those post! These are really beautiful, John. I love the fabric choices everyone made. Great to see you in Houston! Everyone did a wonderful job!!! 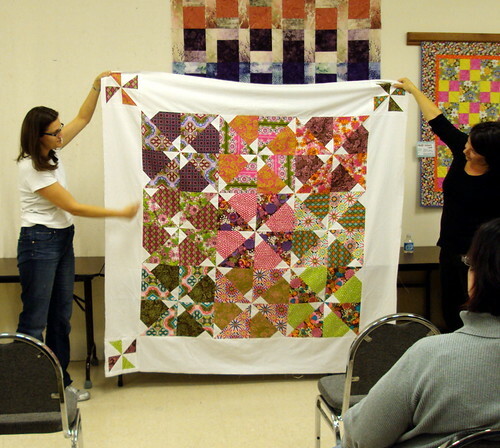 What a quilt show! Thanks for sharing those photos. What a fab guild! 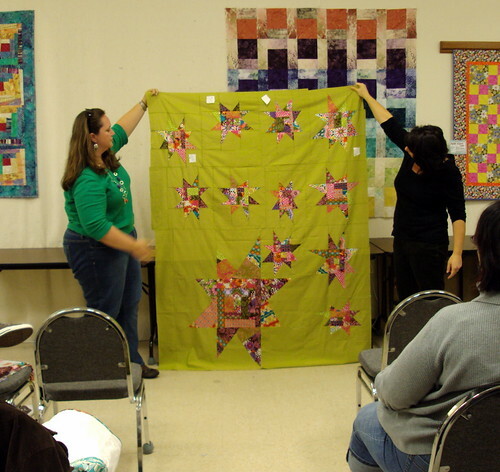 LOVE the quilts that were created. Those are beautiful fabrics and colors. 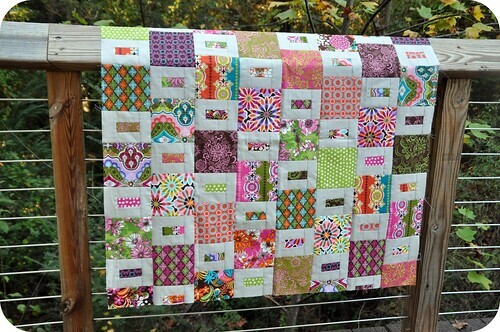 I do love the baby quilt you made and I agree it would look great in a baby girl's nursery. I'm in awe of your guild members. They really pushed the envelope and came up with some great designs for the small amount of fabric they were given to work with. There are some very creative and talented members in your guild. 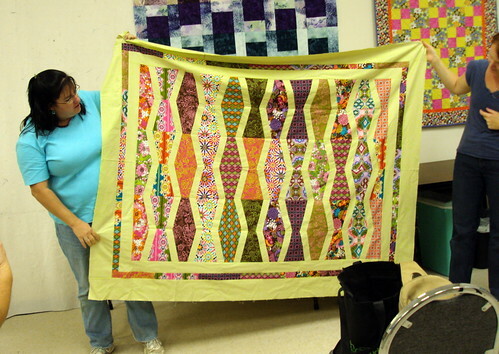 All of the Quilts are Stunning!!!! 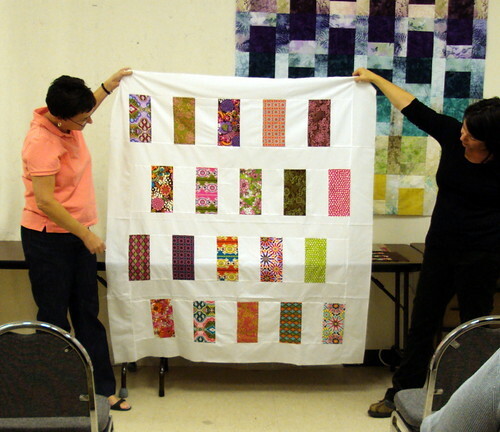 Wonderful quilts made from those fabrics! When and where does your guild meet? What a talented group of people in your guild. 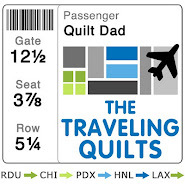 And your baby quilt is cool. These are great - love the variety! They look great!! 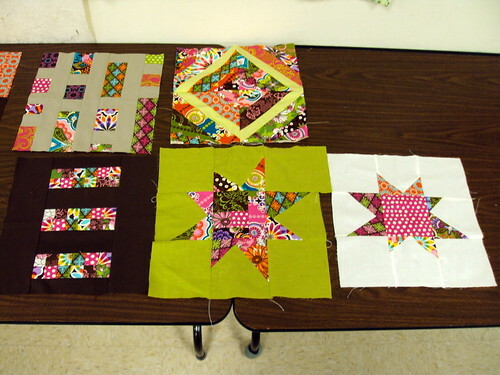 I love yours & the one with the pieced triangles in the border. Thanks for the pictures. 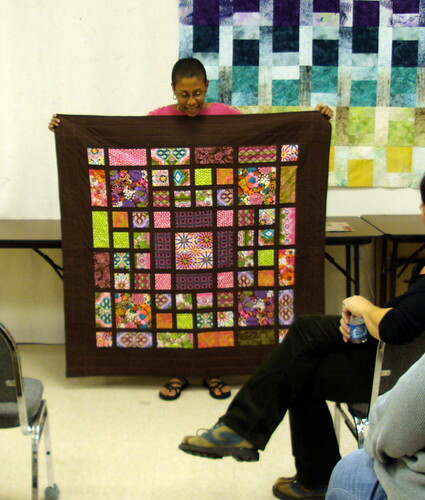 I am sorry I missed the meeting; but now I am happy for the chance to see the quilts. I love your quilt. I loved seeing all the different approaches to the same challenge. You seem to have a very creative group. Now, how does one identify a sophisticated baby? 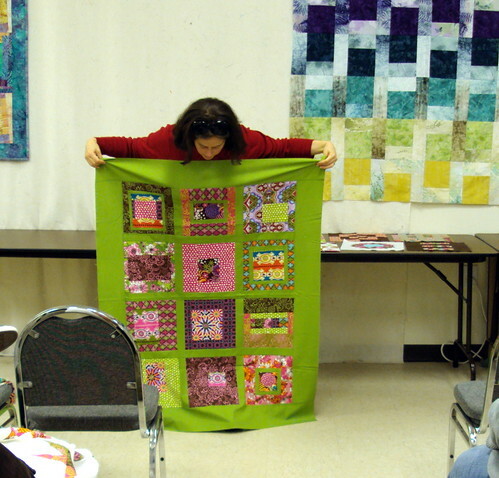 You have some very talented quilters in your guild! Isn't it exciting to see how different each project is? The fabric is beautiful too. Thanks for sharing! What wonderful eye candy! Thanks for sharing.